How to Spot a Counterfeit Coin | Skinner Inc.
One of the largest nuisances in the field of numismatics is detecting counterfeits. Dealers and collectors alike can still find themselves susceptible to coins and currency meant to deceive. Everybody has a story from when they were duped or made mistakes regarding valuable pieces or even seemingly insignificant ones. Every now and then, we see counterfeit pieces brought in by consignors who are unaware of the item they have. 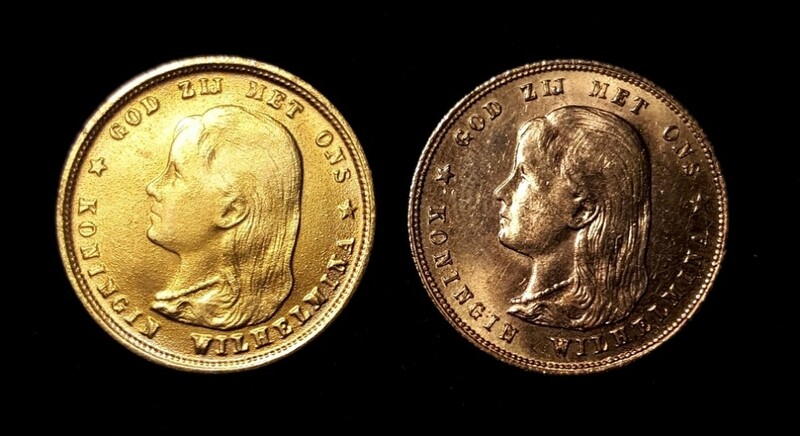 Here are a few easy tips to make sure your coins are original. If a coin looks and feels off, either from the surface or even the color, chances are it’s counterfeit. 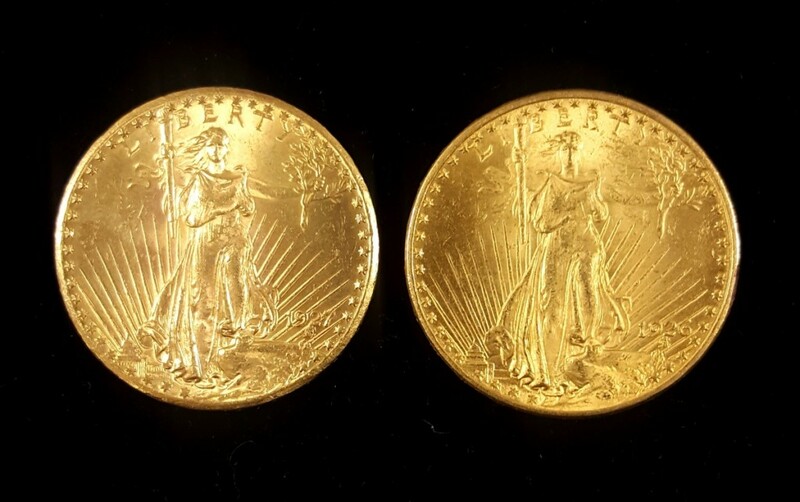 Many counterfeit gold coins are made out of alloys. These have a distinctly different color than gold coins and look more similar to brass. In many instances, these alloy pieces are cast from molds and don’t exhibit the proper surface that a minted coin will. Here you can see the noticeable color difference as well as the sand-cast surface. Also of note, the coin on the left weighs 12% less than the coin on the right. With a scale and a pair of calipers, you can easily identify a variety of counterfeit coins. Many counterfeiters try to pass their products based on looks, but don’t necessarily worry about details. Alloy counterfeits don’t have the same density as gold or silver, and thus will have an incorrect weight. These can be off by as little as a half gram to a few grams, but are significant enough to not be associated with wear loss. Those who attempt to replicate the weight of a real piece will likely not be able to replicate the diameter and thickness because of the wrong density of the alloy. There is the occasional instance where the counterfeit coin is made from the same precious metal of the coin it’s attempting to replicate. This is especially so with U.S. gold coins. Here, we must evaluate the details from the strike of the coin by comparing it to a certified coin. On known counterfeits, there are sometimes die indicators that reveal the true nature of the coin. There can also be a lack of depth to the design and small details having overlooked. By closely studying the details of coins and consistent handling of certified pieces, you can best protect yourself from even the most clever of counterfeits. Both of these coins are identical in size, weight, and gold content. The coin on the left lacks a depthness and attention to detail seen in the coin on the right. One of the most telling characteristics of the left coin being counterfeit is the lettering on the edge seen above. The bottom coin in this picture is the counterfeit. And medals just wondering if skinner would be interested in auctioning them off . I used skinner before with my late brothers royal family items with the help of Stuart in Marlboro . Could you please let me know . Are you in the Marlboro office ? And yes, our Discovery department is in the Marlborough office! We look forward to hearing from you. It really helped when you said that the other aspects of the coin will not be the same when it is a replica because the density of the alloy will be wrong. I will share this tip with my cousin to help him buy the right coins for his collection. He is a newbie to this industry, and he started his interest in this because of the documentary that he was hooked in last month.